The market is segmented by Type (Aircraft Handling, Passenger Handling, Cargo and Baggage Handling), and Geography. 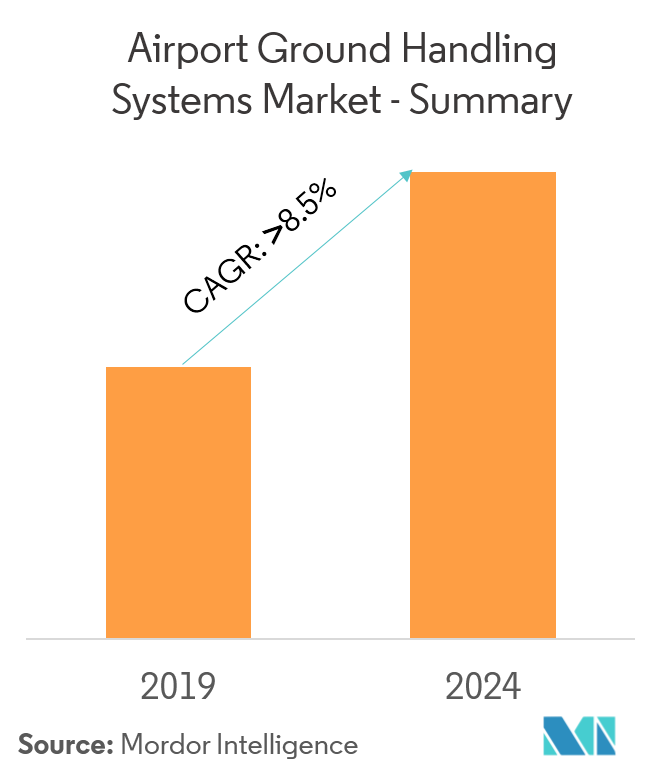 The airport ground handling systems market is anticipated to grow at a CAGR of above 8.5% during the forecast period. The growth in air passenger traffic has made the airlines to expand their fleet size to cater to the rising demand for air travel. This resulted in increased frequency of flights or aircraft movements, which is expected to increase the demand for airport ground handling systems, so as to support ground operations. Privatization of airports will also propel the growth of airport ground handling systems market during the forecast period. The incorporation of advanced technology for airport handling with systems like electric aircraft tugs, fueling automation systems, and augmented reality (AR) glasses for ramp handling operations among others is expected to generate demand for airport ground handling systems in the future. Airport ground handling systems market includes all items and equipment that are used for handling aircraft, passengers, cargo and baggage. Cargo and baggage handling include all equipment from loading at the airport to conveyor belts, sorting mechanism, and software, trolleys, powers trucks, aircraft transfer belts and conveyors, etc., including baggage management systems. However, military cargo and baggage are not included in the study’s scope. 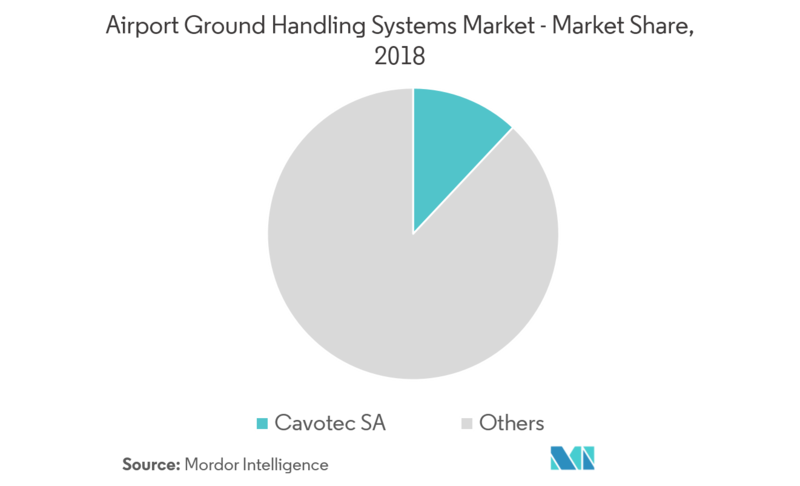 In the Airport Ground Handling Systems Market, aircraft handling segment is expected to have the highest growth during the forecast period. This is mainly due to the growing fleet of aircraft which has increased the flight movements in the airport. To manage the increasing aircraft operations, the need for advanced aircraft handling systems have increased. Also, the current trend of using GSE that have low emissions rates and create green airports has been gaining popularity over the years. ITW GSE is one of the leading manufacturers of GPUs to the aviation industry that is reliable and most cost-efficient ground support equipment. The company has developed ITW GSE 5400 gasoline-powered GPU that run at a variable speed to reduce NOx and other emissions at the airport. Such innovations are also expected to improve the performance of the airport operations and are expected to create a significant impact on the airport ground handling systems market during the forecast period. 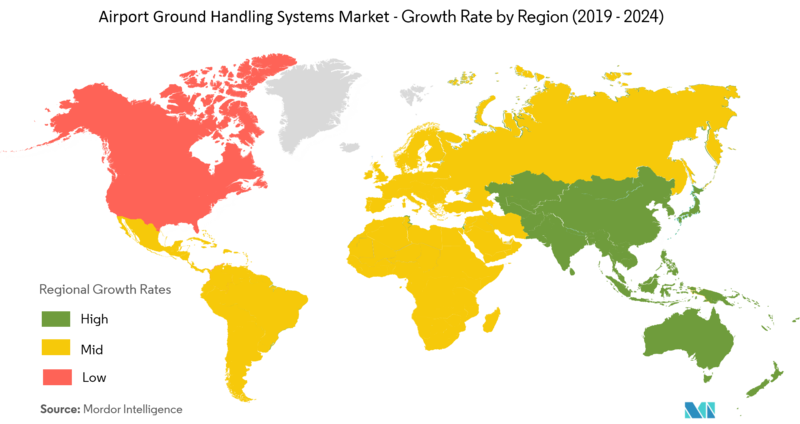 Asia-Pacific region is anticipated to register the highest growth rate during the forecast period. The increasing investments in airport infrastructure in countries like China, India, Indonesia, Taiwan, and the Philippines among others are boosting the growth of this region during the forecast period. For instance, with the growth in middle class and government support, along with increasing air traffic in China, the country is expected to become world’s largest aviation market by 2022, according to the International Air Transport Association. According to the Civil Aviation Administration of China’s Civil Aviation Development 13th Five-Year Plan, the country plans to build 74 new civil airports by 2020, taking the total to 260, up from 175 in 2010. This amounts to more than eight new airports per year to cope with the surge in passengers. Such expansion plans in China, privatization of airports in India and airport expansion plans in Taiwan, Philippines will propel the growth of airport ground handling systems market in the Asia-Pacific region. The global airport ground handling market is highly fragmented with numerous local players. The key players in the market are Cavotec SA, John Bean Technologies Corp, ADELTE Group S.L., Textron Inc. (TUG Technologies Corporation), and Beumer Group. Strategic acquisition and partnership, along with the establishment of manufacturing and production facilities locally, can be helpful for players to establish a foothold in local and regional markets. Also, the development of eco-friendly products by the companies will allow them to capture higher market share owing to trends of green airports.